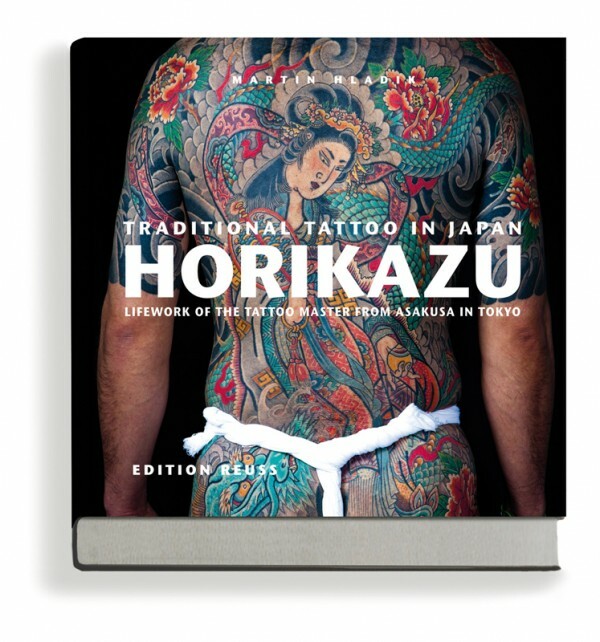 The publishers at Edition Reuss have done it again, with the beautifully laid out and interesting book, Traditional Tattoo in Japan: HORIKAZU. This book is a comprehensive look at the the life work of Tattoo Master Horikazu, from Asakusa, Tokyo. Click through to read the full review. I will freely confess my ignorance to this Master’s tattoo work so it was a pleasure to receive this book and be able to learn about such a highly skilled artist who touched so many with his work. Don’t be mistaken, this is more than just a tattoo book, this is a biography of images and contains not only the artist’s work but also photographs from his own archives, drawings, paintings and a very touching collection of photos from the artist’s funeral service. Horikazu Sensei was a horishi (a traditional Japanese tattoo master) who, the book tells us, had been actively working for forty years. 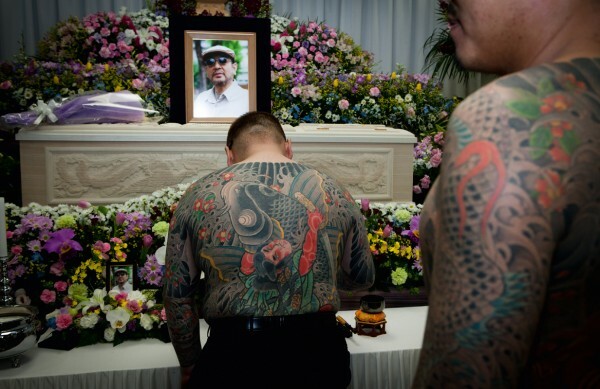 He worked in the traditional tebori method of hand tattooing. The book begins with an interview with Horikazu where he talks about his past, his education in tattooing, some of his experiences, and personal stories, as well as insights into the beauty of traditional Japanese tattoo work. The text contained in the book is not the focus and while the articles are interesting, it is the photos that demand our attention. Personal photos of Horikazu with his family and loved ones give us a glimpse into his life and the way he worked. It feels like a privilege to be able to view photos from his archives, that he collected and saved over his extensive career. These photos reveal his earlier work and stand as a photographic ethnography of traditional tattooing. Also contained within the book are beautiful photographs of artwork done by Horikazu with detailed photos that carry explanations into the designs and motifs. 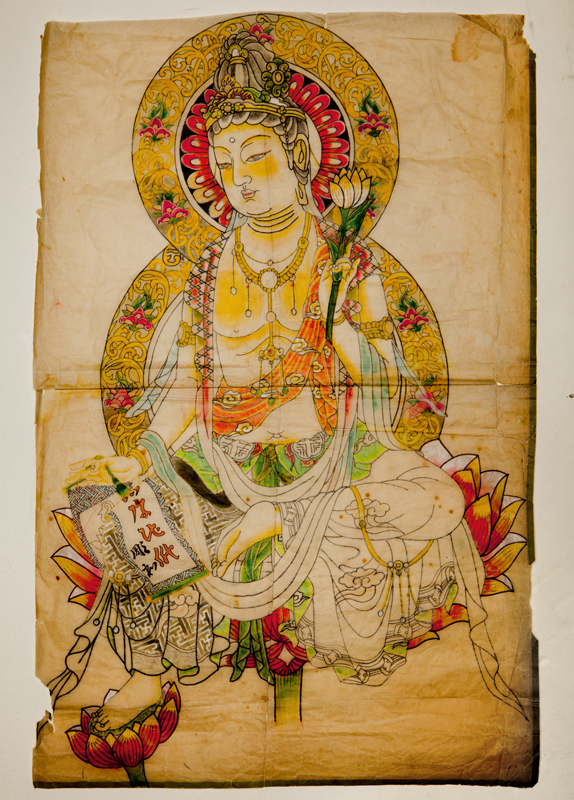 On page 115, we are told that “Lovers often pray to Kannon, asking to be granted the joy of being united in heaven on the same lotus after their death”, with a beautiful accompanying photo of the bodhisattva. These motifs and explanations are as educational as they are a pleasure to look at and would be useful both to tattoo artists and collectors interested in learning more about Japanese art and motifs. Art by Horikazu. Photo by Martin Hladik. The photographs of the artist’s work stand as a testament to the love and loyalty of his clients. They demonstrate the patience and dedication that comes from having such extensive work that can only be completed over many sessions and the lifelong commitment of covering one’s body in tattoo work. One of the striking things about traditional tattoos is that while they cover can cover the body from head to toe, they consist of one piece, a design that carries over the entire expanse of skin and transforms the wearer into living art. We are also taken through a Sanja festival, a three day festival that includes drinking, dancing, and as we’re told on page 397, debauchery. 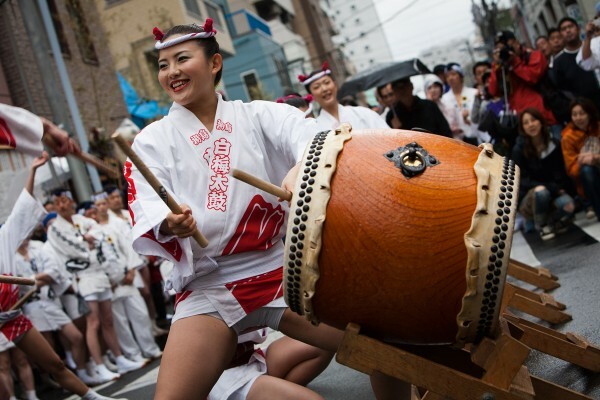 This festival is one in which the yakuza (Japanese mafia) are known to take part. Here they strip down and display their tattoos for all to see, and as we learn from this book, regular citizens mingle with these legendary men. Traditional costumes and geisha are seen at the festival and this section of the book is an interesting glimpse at a culture that is very unlike the West. Another contrast of cultures comes in the section of the book that is a memorial to Horikazu Sensei, who died on November 15, 2011. It was the photos from his funeral which struck me the most as the cultural differences between my own Western (Canadian) upbringing and the Eastern (Japanese) approach were profound. I found myself deeply moved by this series of photos and lingered upon them appreciating the beauty in the way this man’s life was being honoured. The final section of the book is devoted to Horikazuwaka (Horikazu’s eldest son) who is also a horishi in Asakusa. An interview prefaces a collection of photos that show how tradition is being carried on, from father to son. Horikazuwaka carrying on his father’s tradition. Photo by Martin Hladik. Like other publications from Reuss, this book contains text in multiple languages, broadening the scope of reader to include English, French and German. Unlike some of the other publications from Reuss, this is more biography and cultural history than strictly a “tattoo book”. It holds appeal for those interested in traditional Japanese tattooing as well as those interested in Japanese culture. While this is only about one man it is also a broader look at a culture. At a whopping book, weighing in at 7.9 lbs. and containing 492 pages. It is meant for the collector, a beautifully put together work of art of its own right (and would make a handy weapon too, I have a hard time lifting it). This is the sort of book you leave on display and will certainly never lose value. It can be purchased directly through the publisher or at Amazon (and many other online retailers). This entry was posted in ModBlog and tagged Horikazu, tebori, The BME Book Review, Traditional Japanese tattoos by Jen. Bookmark the permalink. love irezumi…beatiful story, great book.